This such a great quote and photo of how hard work is necessary in obtaining what we really want. The ultimate workhorse is not actually a horse, but rather an ant. 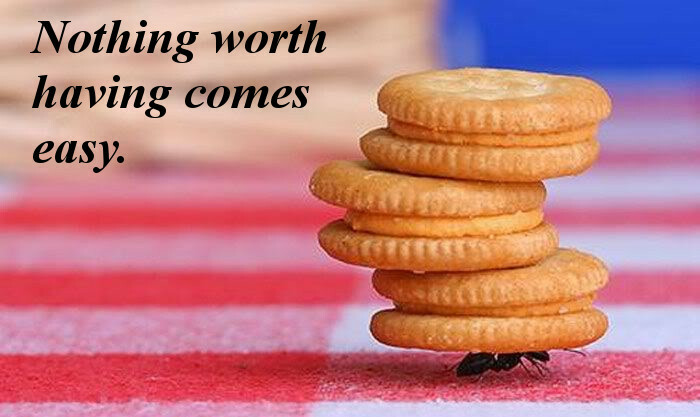 If you ever take the time to observe the pure strength and determination that an ant shows in looking for and carrying its food then you would truly appreciate its ability. We should look to the ant as a source of inspiration because just as it can carry things far greater than its own body mass, so can we accomplish things far greater than even we think possible; so long as we are willing to put in the work. After all, what we really want in life, often times is not easy but rather requires a lot of hard work!